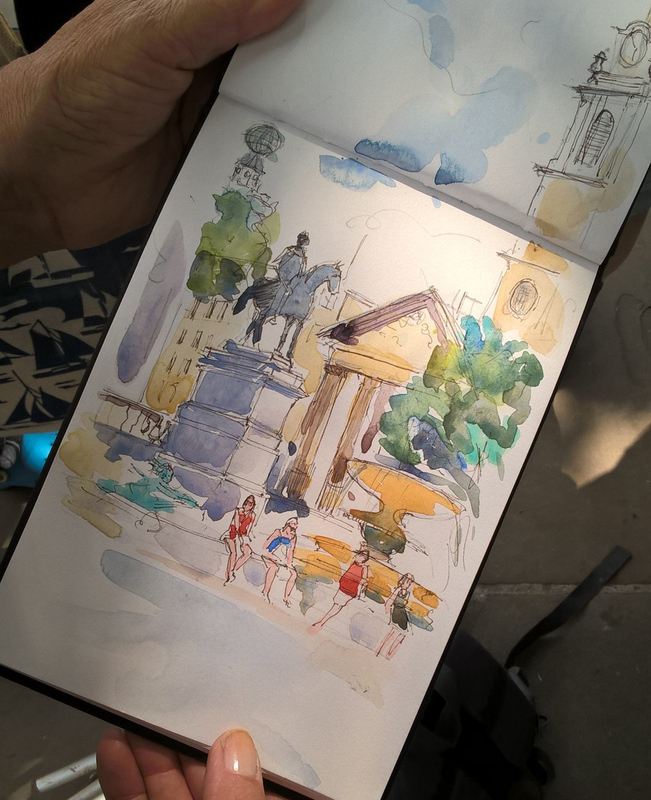 A lovely sunny day for the Trafalgar Square Sketchcrawl today! 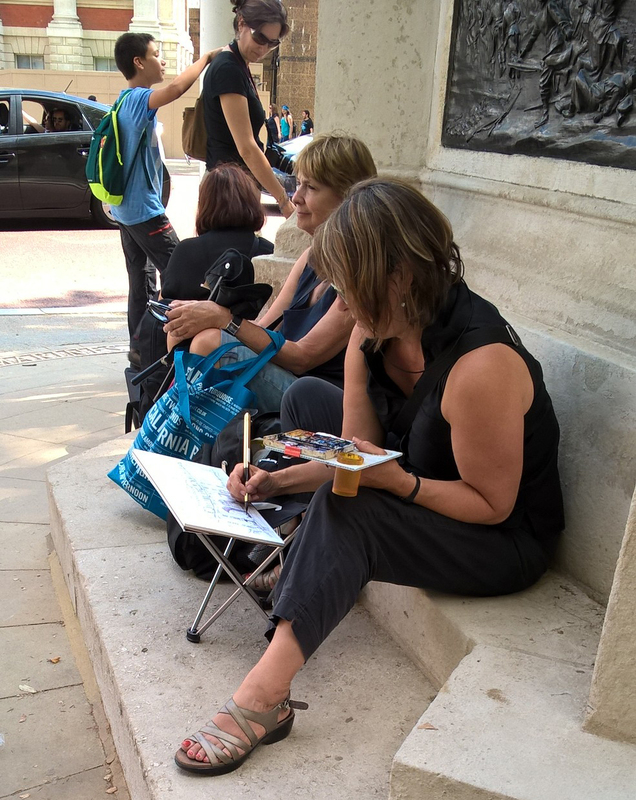 The Square itself provided lots of inspiration for sketchers - this watercolour was by Sheila. There was a busking event taking place and Jason sketched a number of the musicians. 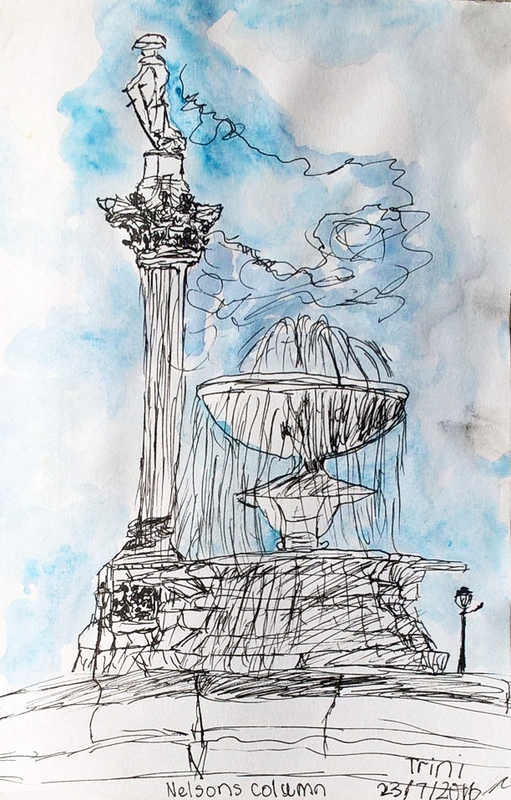 The youngest artist on the sketchcrawl today was Trini, who at only 9 years old produced some wonderful drawings including this one of Nelson's Column. 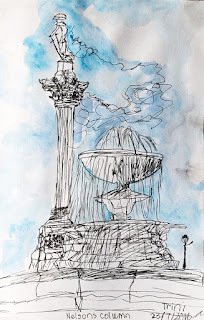 At lunchtime, we met up under the Duke of York Column, with the steps becoming a sort of altar for the sketches of the day so far. The lunchtime group shot with some familiar faces and lots of international visitors on their way to the Manchester symposium. Finding a little shade on a very hot day for London. 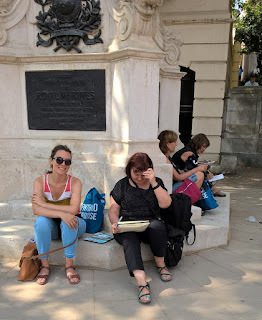 At the end of the day outside St.Martin-in-the-Fields. 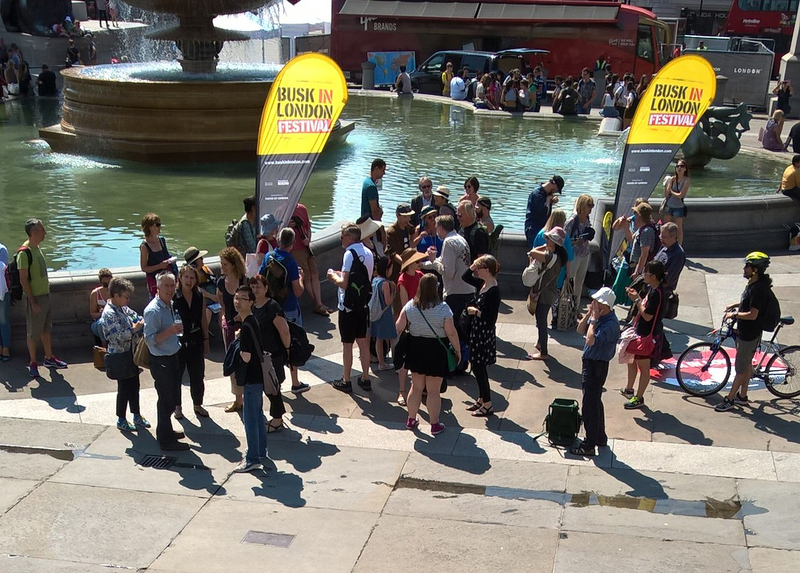 Thanks to everyone for coming along, we hope you enjoyed it. 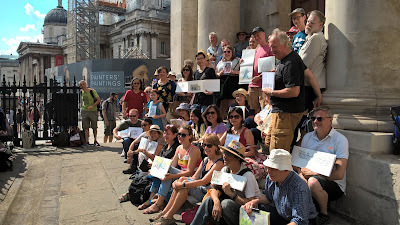 Next month's sketchcrawl is in Greenwich on Saturday 20th August., meeting up at 11.00 am under the bows of the Cutty Sark. 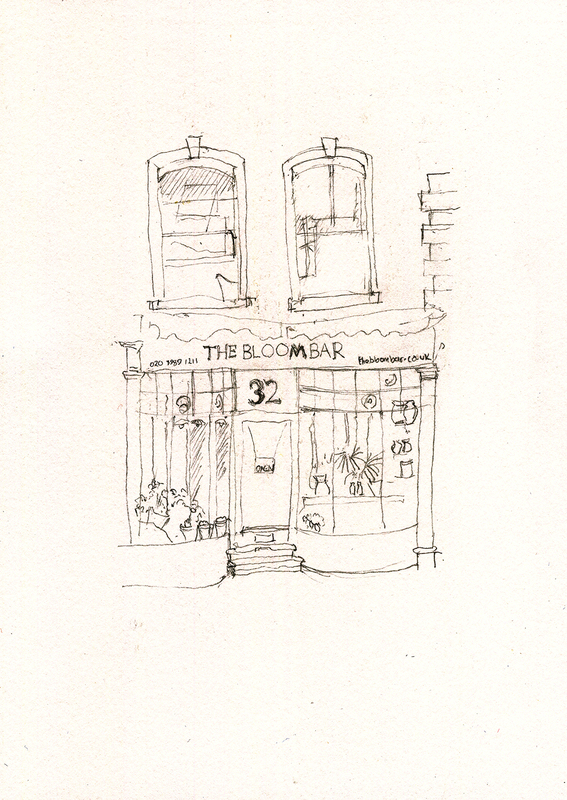 This is the prettier half of a pair of Georgian shop fronts in South Woodford High Road. The other one is a Financial Advisor's office. I see this place everyday and I always thought, "I'll do it another day." Which is the problem when something seems so accessible; there is always another chance. 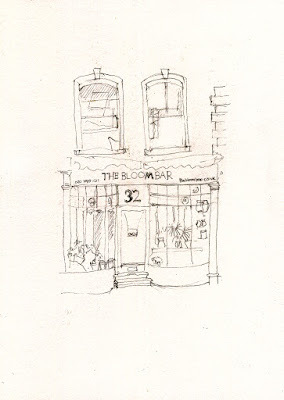 So, last Thursday, on my way home, I used up the last sheet of my Fabriano A5. Are you passing through London on your way to the Urban Sketchers symposium in Manchester at the end of July? 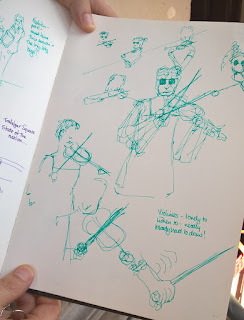 We are meeting up twice on the weekend before it commences, so whether you are heading to the symposium or not, come along and meet us to draw together. It's a great opportunity to meet people from the wider Urban Sketchers community who will be coming from around the globe. Let's Draw Trafalgar Square is on Saturday 23 July, from 11am. We are meeting under the fourth plinth (which currently has Hans Haacke's horse skeleton) close to the front of the National Gallery in Trafalgar Square. Find more details here. 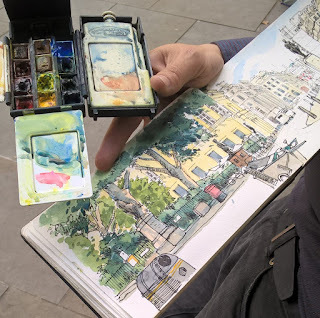 Sketching Wren's London on the following day, Sunday 24 July, is hosted by Pete Scully, who is over from the US. 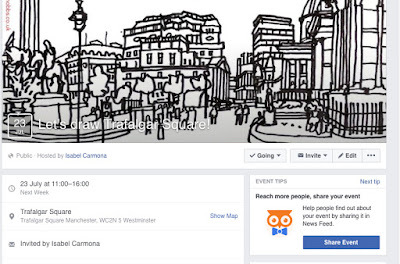 It starts at 10.30am from the front of St Paul's Cathedral. Find more details for this one here. 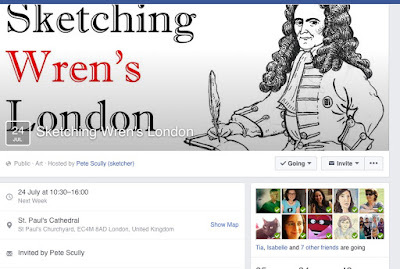 You can also find more info about both of these events by scrolling down to earlier posts on this blog. Hope to see you there – at both!